Eliminate Breeding Sites: Prior to mosquito emergence (late April), locate and drain, empty or remove all potential sources of stagnant water, which can serve as mosquito breeding sites (e.g. unused pools, old tires, tin cans along with other similar discarded containers, rain gutters, and birdbaths). Also, be sure to check and refresh water weekly in small children’s wading pools, birdbaths, and animal water dishes and tubs to eliminate larvae. Keep dumpsters and trash receptacles covered to prevent water accumulation. Eliminate Adult Resting Sites: Cut back or remove dense brush and similar vegetation from around houses and camps. Keep grassy areas mowed short. Promote natural breezes to discourage mosquito occurrence. Encourage Natural Predators: Although limited in their effectiveness, predators such as dragonflies, bats, birds, frogs, and mosquito eating fish naturally control the numbers of mosquitoes, especially in and around small farm and garden ponds or pools. Both the nymphs and adult dragonflies are natural enemies of mosquitoes. The nymphs, which are aquatic, feed on a variety of aquatic insects, including mosquito larvae. Dragonfly adults feed on flying adult mosquitoes. Mosquito eating fish can be used to control mosquito larvae in some situations. However, the Fisheries Division of the Maine Dept regulates introduction of fish to any body of water. Be sure to check with the Office of Inland Fisheries and Wildlife (207.287.5261) to ask about required permits for fish introductions and Maine Department of Agriculture (207.287.3891) to ask about required permits for insect introductions. Water management: Every community should consider water management as a very important component of their mosquito reduction program. There are local, state, federal, and private agencies that can partner or add assistance (some are listed below) to your management programs. Be sure to check with these regulatory agencies before manipulating any body of water. A recognized solution for salt marsh mosquitoes is called Open Marsh Water Management (OMWM). OMWM promotes habitat for mosquito larvae-eating minnows called mummuichogs. Urban wetlands should be cleared of choking vegetation and debris, which provides ideal mosquito breeding sites. Roadside ditches and culverts should be cleared to avoid water stagnation. Beaver dams should be removed to prevent water stagnation. Mosquitoes will breed in the shallow edges of dammed areas. Beaver impoundments elevate water tables, allowing stagnant water to last longer. Cattail marshes should have open water habitat. A monoculture of cattail provides ideal habitat for Coquillettidia perturbans and Culex mosquito larvae. Both have been implicated in West Nile Virus transmission. Survey and map all urban wetland habitats and prioritize them as to their ability to provide habitat for mosquito larvae and their potential for maintenance or restoration. Survey all storm water basins for mosquito breeding. Basins should have annual maintenance plans that include elimination of choking vegetation (especially invasive species) and debris. All inlets and outlets must be cleared. Culex mosquitoes can breed in storm water basins in large numbers. Alert planning departments that mosquito-breeding habitat should be addressed during site planning for development. Typically, basins are designed to hold shallow, stagnant waters. Homeowners and camp owners can alleviate the mosquito nuisance indoors by installing and maintaining tight fitting window and door screens and keeping outside lighting to a minimum. The screening of porches and picnic areas may also be a worthwhile consideration. Specific materials for screen treatment containing insecticides, such as permethrin, may add to the effectiveness of screens. Space spraying of tents or sleeping areas before use may also help, but read and follow pesticide label directions carefully. 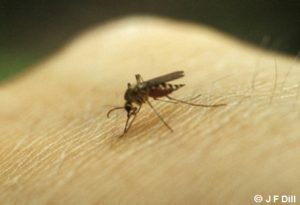 Beware of novelty approaches to mosquito control, including such things as “bug zappers,” various sound devices, and scented geraniums (“mosquito plants”). While there may be certain psychological benefits to the use of such things, they are usually expensive and there is little scientific evidence to support the claims of those who market such products. There is no sure fire solution to the problems as some would assert. The use of protective clothing and insect repellants are two tactics that can provide some personal protection against adult mosquitoes, and are especially suitable for hikers, campers, picnickers, fisherman, and others who are active in mosquito infested areas. Types of protective clothing include veils or mosquito netting worn around the head, or even the entire body as a suit, high boots, long sleeved shirts, long pants, gloves, etc. Insect netting fashioned into a bed net can also provide excellent protection for those camping or sleeping in the open. As with many biting flies, it is best to avoid the use of colognes and perfumes while in the field as these may enhance biting fly activity! Insect repellents are chemicals that can be applied to the skin or clothing that will repel mosquitoes and to a lesser extent black flies and ticks. A number of products are available, and come as pressurized sprays, creams, sticks and liquid formulations that are usually spread on exposed parts of the body. The CDC recommends using products that have been shown to work in scientific trials and that contain active ingredients which have been registered with the US Environmental Protection Agency (EPA). The two repellents that have demonstrated a higher degree of efficacy in the peer-reviewed, scientific literature are DEET and Picaridin. Studies indicate that oil of lemon eucalyptus, a plant-based repellent, also provides protection similar to low concentrations of DEET. Usually a few drops of repellent applied to the neck, face, hands, and arms or sprayed onto thin clothing items such as stockings can repel mosquitoes for periods of 2 hours or more. Since repellents can irritate the eyes or the lips, care should be taken in their application. Be sure to read the instructions to make sure the repellent won’t harm clothing or especially plastic items. Do not over use repellents. Be especially careful with DEET on young children. For more information regarding the use of repellents visit Centers for Disease Control and Prevention: West Nile Virus. If chemical controls are to be considered for the management of mosquitoes, be sure to consult with professionals. Applying chemicals for the control of mosquitoes is a very sensitive issue, especially because of their association with water. It is best to secure the services of a state certified and licensed pesticide applicator to use the proper chemicals and techniques. For more information on pesticides and licensing, contact the Board of Pesticides Control (207.287.2731). Before applying any material to water, such as the growth regulator methoprene or the bacteria Bacillus thuringiensis var. israelensis (Bti), for the control of larvae, contact the Maine Department of Environmental Protection (DEP: 207.287.7844) to get the needed permits. For management recommendations, contact the University of Maine Cooperative Extension Pest Management Office (207.581.3880).